The Temperance Seven were formed at the Royal College of Art during 1957, although they were fictionally founded at the aptly named, but non-existent, Pasadena Cocoa Rooms in Balls Pond Road, London. The band usually had nine members (one over the eight!) and dressed in the style appropriate to the late 1920s jazz they played. The members shown above are typical of those in its chart topping hey-day. The members generally gave themselves fictitious titles. John R.T. Davies used the pseudonym Sheik Wadi El Yadounir and wore a fez. On the first hit numbers vocals were provided by 'Whispering' Paul McDowell who was replaced later by Allan Moody Mitchell. The band once appeared in Spike Milligan's 'The Bed Sitting Room' and spawned new interest in the styles of the 1920s. The band appeared at the London Palladium for a 2 week show (Sharing the top of bill with Shirley Bassey), played at a Royal Command Performance, and did a number of private parties for the late Princess Margaret. The original group fell apart towards the end of the 1960s, but new personnel- sometimes guested by original members- still play today. However, many members of the original band did re-unite- and play together- briefly for a BBC radio programme about themselves during 2003. The EP illustrated on the left (GEP 8840) clearly shows the 'seven' to be 'nine'. This disc appeared when the band were close to their peak of popularity. It contains their most memorable tracks:- "You're Driving Me Crazy"; "Charley My Boy"; "Pasadena"; "Sugar". 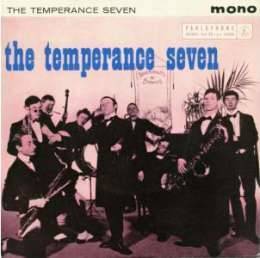 It's interesting to note that the Temperance Seven harked back to a musical format of almost 40 years earlier, whereas it is now more than 40 years since this EP was on sale! Sadly, R.T. and Alan Cooper have now passed away, however most of the others are still in contact with each other. Thanks are due to Ralph Peters (the band's manager from 1961 until 1964) for additional, updated and corrected information.